The AOC U3277PWQU is as good as it gets for a monitor of this size with a 4K resolution. Availability is still tricky but should improve shortly. Whether or not it is worth paying a big premium for an extra 3.5-inches of diagonal – compared to 28-inch models – is the fundamental question. Better-than-full-HD monitors are becoming cheaper with the average price of 4K models dropping markedly compared to just two years ago. That, coupled with the fact that most models now come with 60Hz input, means that there has never been a better time to buy a 4K display. However, competition comes from 4K televisions which can often be purchased for less – until recently, you could buy a 40-inch 4K model for well under £300 (around $385, AU$500). But you won't find smaller size TVs and there are a number of reasons why you should opt for a real monitor rather than a television display. 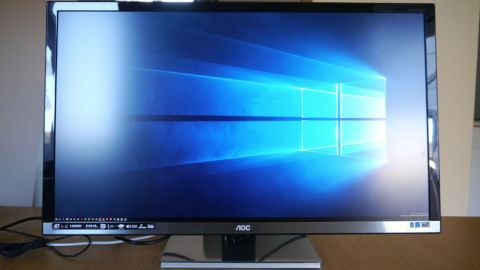 AOC sent us its latest large-size monitor, the U3277PQWU, a 32-inch offering which has yet to appear in the UK and will carry a suggested retail price of £579 (around $745, AU$970) but can be purchased for less than £500. It has a smaller 27-inch sibling, the U2777PQWU, which costs marginally less, making the bigger model the better value-for-money option. Competition at this price is almost non-existent – you won't find a more affordable 4K monitor of this size. There are cheaper but smaller 4K displays (24-inch and 28-inch respectively) and while an extra few inches on the diagonal might not sound like a lot, it is actually quite substantial in the flesh. AOC pitches the U3277PWQU as a premium 4K display, one that sports an AMVA panel (rather than an IPS one). Compared to the 27-inch models we tested before (like the AOC U2879VF 4K monitor), the U3277PWQU is significantly heavier with a 31.5-inch diagonal which AOC, like many rivals, rounds off to 32-inch. That translates into a bigger stand, a thicker and heavier body, with a larger bezel; the former is substantial in size to ensure stability. The added girth explains why AOC saw fit to throw in a 4-port USB hub (2 x USB 3.0 and 2 x USB 2.0) and the power supply unit, which was external on the U2879VF. The bezel is bigger than on a smaller display, possibly to sustain the weight of the LCD panel, and is also far too glossy for our tastes and can prove distracting especially if there's a source of light behind you. The lower bezel is covered with a brushed metal face which adds to its premium feel once you peel off all the unnecessary stickers. But again, it proves slightly distracting as it is as glossy and reflective as the other three black bezels. The AOC U3277PWQU offers a reasonable degree of tilt (5-degrees forward and 24-degrees backward), swivel (165-degrees each way), pivot (90-degrees clockwise) and height adjustment (180mm). Putting the stand and the panel together is pretty easy. You have to lie the panel down on a flat surface, fix the stand using four screws and then the plinth, in that order. A slot-and-click mechanism would have been preferable for ease of use and to avoid jamming the screws. At the back of the monitor you'll find an HDMI 2.0 port with MHL, dual-link DVI, DisplayPort, VGA and two audio jacks. The monitor consumes a not-so-insignificant 60W in use, falling to 500mW in standby. Note that there are 100 x 100mm VESA holes so you can also use a third-party monitor stand or put this peripheral on the wall. At any rate, there's a good array of ports here, but bear in mind that only 4K-capable devices will be able to make the most out of them. That means having a system with DisplayPort 1.2 or HDMI 2.0 at least, and with graphics subsystems that can drive 4K content at 60Hz – that excludes HDMI 1.4 systems and DisplayPort 1.1. There's a pair of integrated 3W speakers as well but don't expect them to rock your room as separate speakers might. AOC also included half a dozen cables to cover all eventualities. AOC is one of the rare vendors to provide a colour uniformity data sheet at shipment. For the uninitiated, that's a document which details the essential metrics associated with the monitor. That includes brightness uniformity, gamma, sRGB, along with average Delta E – the last two are arcane measurements which are mostly only useful to those who deal with monitor readings, but what all this indicated is that, out of the box, this monitor should deliver a consistent and acceptable viewing experience. AOC claims that the monitor will deliver 95% and 100% of the NTSC and sRGB gamuts respectively, something we didn't test. It does also offer 10-bit colour, which equates to more than a billion colours. The rated brightness and contrast ratio are 350 cd/m2 and 3000:1 respectively with a response time of 4ms. We didn't detect any ghosting, edge bleeding or flickering. The colours looked realistic and accurate. Bear in mind that the monitor was used in a business setup only, linked to a laptop with the only content displayed being Word documents and spreadsheets. We loved the matte finish of the panel which contrasted (pun intended) with the bezels' enthusiastic propensity to reflect light. There's no need for calibration out of the box but your mileage may of course vary; we did notice that whites tended to be less punchy than we'd expect. But then again, that's nothing that the OSD (onscreen display – operated via four menu buttons on the bottom edge of the monitor) settings shouldn't be able to solve. The OSD on the U3277PWQU is reasonably complete, allowing you to customise picture-in-picture as well as picture-by-picture settings. Put simply, if you want to buy another 32-inch monitor with a 4K resolution, you will have to fork out extra dough. There are a number of potential competitors around the £650 (about $835, AU$1,090) mark: the Acer B326HK, the BX320HK, BenQ's BL3201PT and the Philips DBM3275UP. It is also worth keeping an eye on the predecessor of the U3277PWQU, the U3277PQU (note the missing 'W'). The older model has an IPS panel which translates into a lower contrast ratio (rated 1000:1), a lower price tag, and it's half an inch bigger (in other words, true 32-inch as opposed to 31.5-inch rounded up). Businesses – and those working in financial services – will consider the AOC U3277PWQU (and indeed any large 32-inch 4K monitor) for a number of reasons. It provides a massive amount of usable screen real-estate, and can replace up to four full HD monitors with only one computer driving it. Furthermore, its plethora of connectors means that you can actually hook up several devices (although only DisplayPort and HDMI can do 4K) and multitask to your heart's content.